22 Sept 2012: [Extension] A nice sunny day, and a small amount of progress was made, mainly in making small brackets in aluminium to hold the structure together - which until now has enjoyed the benefits of Gravity, and henceforth is properly stitched together. My original idea was aluminium strip on all seams and corners, but this seems a bit over the top. 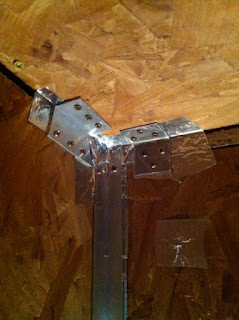 One function of the aluminium was to make it airtight, but I have discovered the magic properties of aluminium foil tape, and it is sufficient for airtightness to tape every joint. Structurally, it is sufficient to have angles in some places, but to have brackets in less critical places. 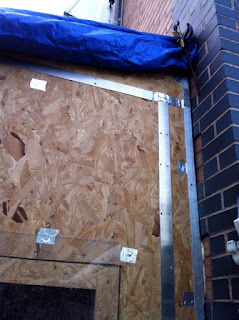 All the angles will be covered either with plasterboard or rain screen cladding, so looks do not come into it. 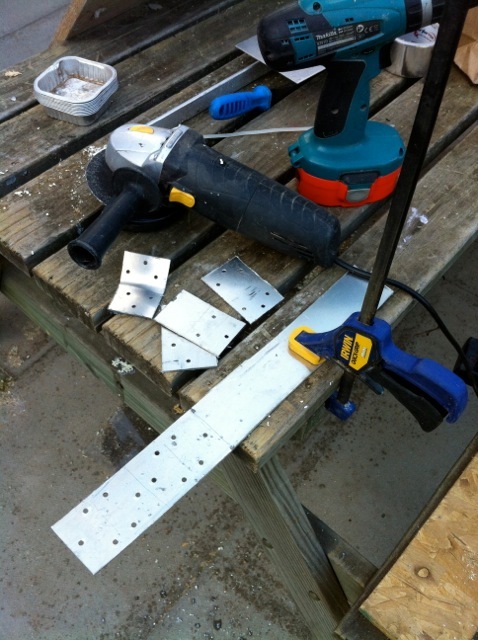 Some 105º angle brackets are required, so the easiest method is to make these from 1.2mm aluminium… you will not find these in B&Q! 105º brackets now made, and some had to be made at 75º too, for the roof junction with its wall plate. Earlier seams in the construction were over structured with continuous strip, but they can stay now. I can save aluminium by using smaller plates and brackets in future, and relying on the special metal tape for the airtightness - here you can see it has been put on every nylon bolt-head. 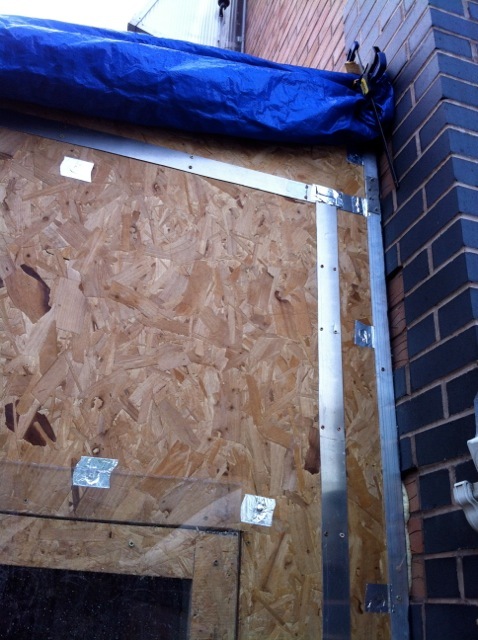 The roof is still a large tarpaulin, held on with clamps. 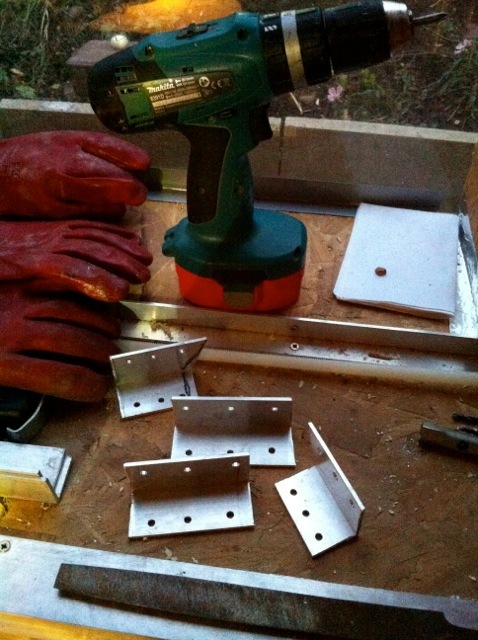 Some stronger brackets in 3mm aluminium are used for securing the roof panels to the gable walls. 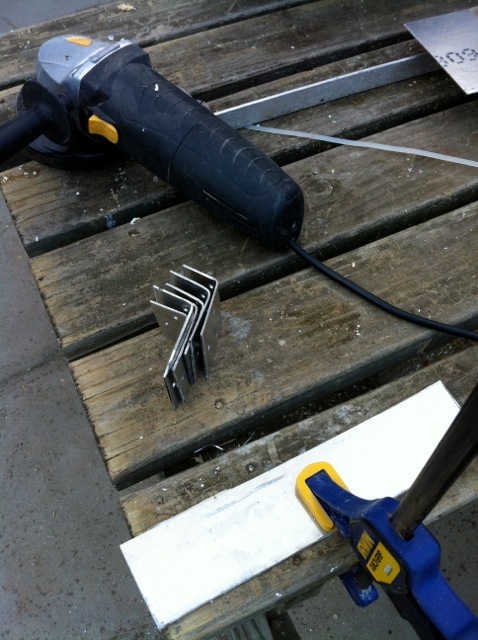 I have run out of the metal tape and must go to Screwfix in the morning - tape will be continuous on all joints. But I have taped where all the brackets are going, and a group of brackets are illustrated here.